True Life: I'm an adult baby. Do you remember watching that True Life episode on MTV? Yeah, us too! It was life-changing to see grown adults carrying on as unconvincing babies, however we couldn't get over one tiny detail: why didn't these people invest in better costumes? Their get-ups didn't resemble those worn by real babies; they looked more like cradle-dwelling adults who had really bad table manners. Immediately we thought, Jeez, we really need to help these adult babies out. So we made it our mission to hook them up with a more convincing guise. 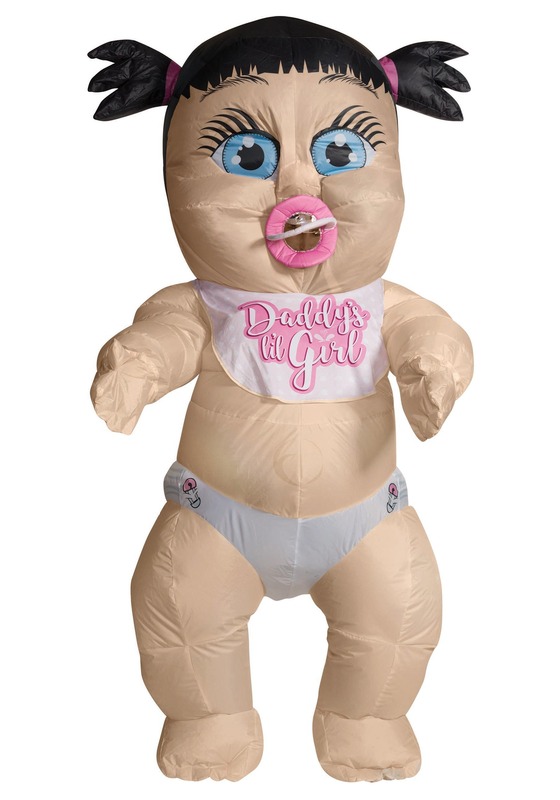 Introducing this inflatable adult baby girl costume! This inflatable costume will prove that you are fully committed to your diaper-wearing lifestyle. Just crawl inside the jumpsuit and connect the fan cord to the battery pack. Once those two appliances are joined, clip the battery pack to your waist and your costume will stay inflated. Clear plastic covers the pacifier so you can see out, but others won't easily be able to see in. Everyone will finally perceive you exactly how you perceive yourself: as a large-and-in-charge newborn, ready to goo goo and ga ga your little heart out. We're hoping this costume will fulfill all your infantile needs, but if by chance it doesn't, don't hold back. Throw the temper tantrum of a lifetime! There's nothing more fitting than an adult dressed in an inflatable baby costume having a public meltdown.